In their lightless sanctuary, an army of serpentfolk gathers to bring the world above to it knees. The skull of the dead god Ydersius has fallen into the hands of his worshippers once more, and fanged fanatics now commence the rites to resurrect their slain deity. Only the heroes stand between the serpentfolk and their insane plot to unleash one of existence's foulest tyrants once more upon the world. Can the PCs gather the weapons and allies they need to strike back against the snakes and slay their decapitated god once and for all, or will their failure to do so usher in the Age of the Serpent? 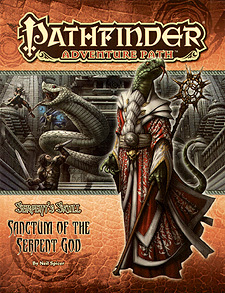 Decide the fate of an entire world in this, the climax of the Serpent's Skull Adventure Path. The triumphant conclusion of the Pathfinder's Journal, by Robin D Laws. Five new monsters, by Jesse Benner, Rob McCreary, and Neil Spice.